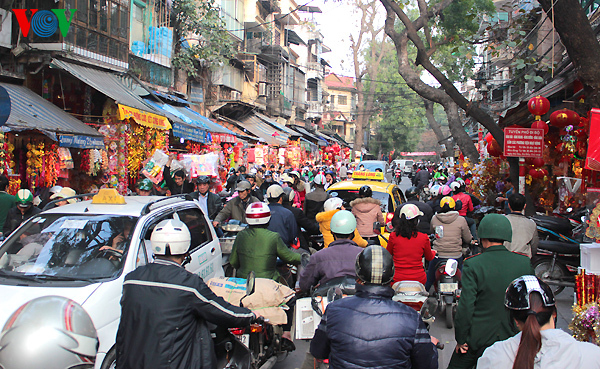 Hang Ma street in Hanoi is famous for its votive object marketplace serving a range of spiritual ceremonies, including the Kitchen Gods Festival observed on the 23rd day of the 12th lunar month. The Kitchen Gods are considered the guardians of every household’s kitchen. The one female and two male gods are said to maintain a kitchen’s fire throughout the year. It is believed that on the 23rd day of the 12th lunar month every year the Kitchen Gods ride carps to Heaven and present a report on each household’s activities to the Jade Emperor. To observe the ceremony, people buy and offer the Kitchen Gods objects such as clothes, hats, and boots, all made of paper, as well as a fresh carp. After offering incense to the Gods, they burn the votive paper objects and release the carp into nearby rivers, hoping that the Gods will ride to Heaven and speak well of them before the Jade Emperor. The ceremony is observed several days before the Lunar New Year (Tet) festival which falls on February 10 this year. Walking along Hang Ma Street these days, visitors feel lost in a sea of decorations for the Tet holiday. Shop owners are busy displaying goods …..
… Customers also hurry to choose their favourites. They are displayed on the pavement ….